If you don’t (and chances are you don’t) then a new lens for Unity lets you access online copies of these leaflets, along with additional information on your medicine’s characteristics. Unless you’re a health-care professional (or deeply interested learning more about your medication) you can ignore the top results. 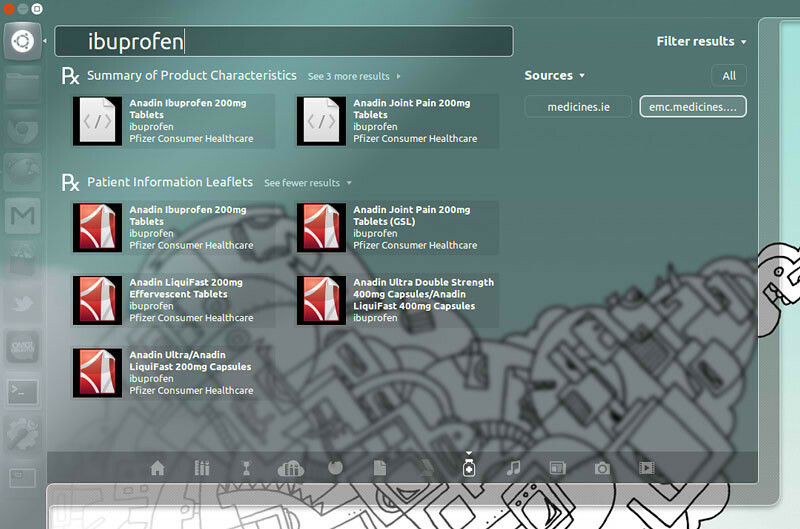 Depending on your location the lens will serve up data from either Medicines.ie or emc.medicines.org.uk. A filter is available should you wish to swap between sources. Information provided by this lens is not intended to replace proper medical advice from a health-care professional. After installation has completed you will need to log out of your desktop session and back in before the Lens appears in the Unity Dash. No Comment to " Install Medication Lens in Ubuntu 12.04 Unity "